Replacing traditional space ownership with a community of shared spaces meets the needs of today’s workers, fluid workstyles and collaborative group-based work. Whether you are considering a move to hoteling (a reservation-based system), free address (first come, first served) or a combination, unassigned seating can create an adaptable workplace that yields numerous benefits to your organization and its employees. Shared workspaces can help optimize space utilization, potentially reducing real estate expenses. 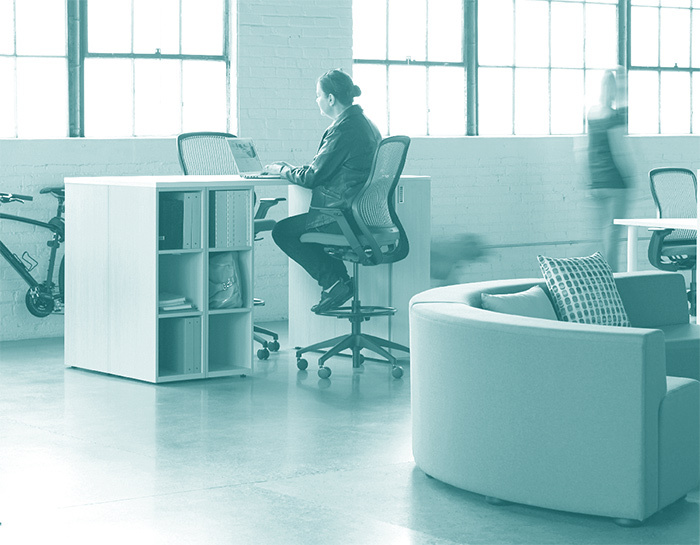 Additionally, the varied spaces within an unassigned environment empower individuals to choose the workspace they want at the time and place they prefer. Adjusting to the new norms of working in a shared space will no doubt take some time. Management can provide direction by giving employees the tools and training needed to thrive in the new setting. Part of the training should include developing and introducing appropriate guidelines for the workforce. Clearly, articulating expectations and etiquette will help streamline your organization’s adjustment to its new environment, avoid misunderstandings, minimize downtime and reduce stress levels. Enlist support from the top. Top-level leadership and support is vital to a successful shift. Engage leaders early and encourage them to be active and visible through the change process. Direct managers also play a vital role in delivering information and reinforcing policy and protocol. Explain the business case and design detail. Share the business reasons for the change with your employees when you give an overview of how the new workspace works. Use varied messaging and maintain a positive, informative tone as you highlight ways it will better meet the needs of the organization and individual. Reassure employees that they have access to ample spaces to work, socialize and store their belongings. Explain that all seating ratios have been well-thought out and based on careful consideration and planning. All levels of attendance will be accommodated, from full-time, resident on-site workers to occasional and infrequent employees and visitors. Facilitate the transition to an unassigned space. Provide support and tools necessary to assist employees in the change. Suggest that large personal items be taken home, unneeded materials discarded and paper files purged well before the move date. Provide access to scanners and shredders to facilitate the move to digital records. Consider offering incentives or sponsoring a company-wide contest for purging physical files. Consult with Human Resources and Labor Relations to assure compliance. Appropriate departmental representatives should be involved to ensure that any guidelines you create align with existing policies. Verify that the appropriate infrastructure is in place and operational. This encompasses several areas such as technology, housekeeping and training. Deliver guidelines. Use the release of guidelines as an opportunity to reiterate your message and mission. Depending on the number of employees involved in the change, guidelines can be incorporated with other training meetings related to the move. If that is not practical, the guidelines can be posted on the corporate intranet and/or presented via “lunch & learn,” webinar, town hall or other methods appropriate to your organization’s size and culture. Additionally, direct managers should reinforce policies in staff meetings and other team interactions. Celebrate the move with positive experiences. Reinforce a community message to ease apprehension. Host events and document the company-wide transition using community boards and similar forums. Encouraging individuals to participate by sharing photos and feedback on the move can help build engagement and buy-in. Consider providing a welcome letter from leadership and a small office-related gift to each employee on move day. Distribute all essential materials and guides. In addition to the sample guidelines presented, develop a printed series of handouts such as office plans, technology instructions and codes, and any other needed guides that employees can refer to. Post signage in restrooms with proper handwashing technique. Consider tasteful visual reminders about the importance of wiping down common surfaces. On move day, have staff on-hand to resolve problems and answer questions. Lead by example. Implementing and maintaining a successful change starts in the C-suite. Encourage all levels of the organization to be a good example and enthusiastically adopt the new setting. Monitor and adjust. Allow time throughout the process to assess the successes and shortcomings of the change process. Make regular rounds to observe how new policies and protocols are working. Engage in frequent face-to-face conversations to gain direct and unfiltered feedback. Build in means for users to submit comments on how they feel the new space and guidelines are working after about 90 days. Based on insights learned, policies and procedures can be tweaked as needed. A well-executed designed and executed plan will streamline the process, reduce anxiety and misunderstandings, and hasten acceptance, assuring a smooth transition and adaption to the new environment.